The Presidential election forecasting models I’ve been following this election cycle are all pointing toward a Clinton victory. Now we have to wait and see. This model does not use state-level information or the electoral college (see my blog post here). It appears to be a better mid-term or long-term forecasting model. Andrew Gelman: Different election forecasts not so different. FiveThirtyEight: Why Our Model Is More Bullish Than Others On Trump. Covariances are crucial. Is 99% a reasonable win probability? Sam Wang: Yes. Which forecasts are true? Are win probabilities even defensible? There are 96 days until Election Day, but I’m already pretty sure Hillary Clinton will win the election. The Keys to the White House by Allan Lichtman and Vladimir Keilis-Borok is a simple mathematical model that predicts who win a Presidential election. This model predicts who will win months or even years before an election. You can read the writeup in OR/MS Today here. Let’s look at why Hillary will likely win in 96 days. The model works by considering 13 factors that are equally weighted in the model. The reference point is the person running in the same party as the incumbent President, which is Hillary Clinton in 2016. There are five “Falses.” When five or fewer statements are false, the incumbent party wins. When six or more are false, the challenging party wins. It looks like barring a surge ahead for third party candidate to something like 1992 Ross Perot levels (see #4), five or fewer statements will continue to be false. I’m not sure if the model is flexible to account for a divisive figure like Donald Trump, but we will find out soon. What is interesting is that this model requires no polling information, which is a major input requirement to most other models (like the one at FiveThirtyEight). It instead looks at underlying causes for support for the political parties based on how satisfied we are with various things that have happened, hence the “keys” about social unrest, war, major policy change, major scandal, and the economy. I blogged before about the importance of the economy in making Presidential election forecasts (“It’s the economy stupid“). Do you think traditional ways to forecast the election will “work” this year? After extensively blogging about the 2012 Presidential election and analytical models used to forecast the election (go here for links to some of these old posts), I decided to create a case study on Presidential election forecasting using polling data. This blog post is about this case study. I originally developed the case study for an undergraduate course on math modeling that used Palisade Decision Tools like @RISK. I retooled the spreadsheet for my undergraduate course in simulation in Spring 2014 to not rely on @RISK. All materials available in the Files tab. The basic idea is that there are a number of mathematical models for predicting who will win the Presidential Election. 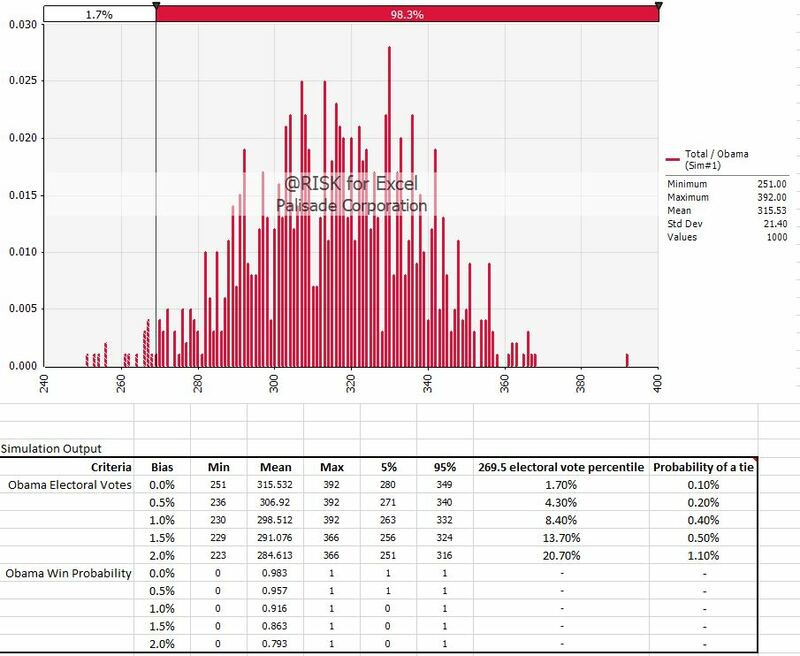 The most accurate (and the most popular) use simulation to forecast the state-level outcomes based on state polls. The most sophisticated models like Nate Silver’s 538 model incorporate things such as poll biases, economic data, and momentum. I wanted to incorporate poll biases. For this case study, we will look at state-level poll data from the 2012 Presidential election. The spreadsheet contains realistic polling data from before the election. Simulation is a useful tool for translating the uncertainty in the polls to potential election outcomes. There are 538 electoral votes: whoever gets 270 or more votes wins. Everyone votes for one of two candidates (i.e., no third party candidates – every vote that is not for Obama is for Romney). The proportion of votes that go to a candidate is normally distributed according to a known mean and standard deviation in every state. We will track Obama’s proportion of the votes since he was the incumbent in 2012. Whoever gets more than 50% of the votes in a state wins all of the state’s electoral votes. [Note: most but not all states do this]. The votes cast in each state are independent, i.e., the outcome in one state does not affect the outcomes in another. There is some concern that the polls are biased in four of the key swing states (Florida, Pennsylvania, Virginia, Wisconsin). A bias means that the poll average for Obama is too high. Let’s consider biases of 0%, 0.5%, 1%, 1.5%, and 2% and implement (all states affected by the same bias level at the same time). For example, the mean for Wisconsin is 52%. This mean would be 50% – 52% depending on the amount of bias. Side note: Obama was such an overwhelming favorite that it only makes sense to look at biases that work in his favor. The poll statistics of the mean and standard deviation for each state. The number of electoral votes for each state. An indicator variable to capture whether Obama won the election. (1) Using the spreadsheet, simulate the proportion of votes in each state that are for Obama using a spreadsheet for each of the 5 scenarios. Run 200 replications for each simulation. For each iteration, determine the number of electoral votes in each state that go to Obama and Romney and who won. (2) Paste the model outputs (the average and standard deviation of the number of electoral votes for Obama and the probability that Obama wins) for each of the five bias scenarios into a table. (3) What is the probability of a tie (exactly 269 votes)? Obama took 332 electoral votes compared to Romney’s 206. Do you think that this outcome was well-characterized in the model or was it an unexpected outcome? Look at the frequency plot of the number of electoral votes for Obama (choose any of the simulations). Why do some electoral vote totals like 307, 313, and 332 occur more frequently than the others? Why do you think a tiny bias in 4 states would disproportionately affect the election outcomes? How do you think the simplifying assumptions affected the model outputs? No model is perfect, but an imperfect model can still be useful. Do you think this simulation model was useful? I don’t give the results to my students ahead of time, but here is a figure of the results using @RISK. The students can see how small changes in poll bias can drastically affect the outcomes. With no bias, Obama has a 98.3% chance of winning and with a 2% bias in a mere four swing states, Obama’s chances go down to 79.3%. @RISK output for the election model. The histogram shows the distribution of electoral votes for the unbiased results. The table below tabulates the results for different levels of bias. Here are the instructions, the Excel spreadsheet for Monte Carlo simulation, and the Excel spreadsheet that can be used with @RISK. Sheldon Jacobson’s team at the University of Illinois has its Election Analytics site up and running again that is predicting the probability that the Republicans will take the Senate. His method uses Bayesian estimators that use available state poll results. Of course, Nate Silver has a Senate forecasting model on FiveThirtyEight and provides a nice discussion of how the polling data is used in the forecasting model. Matt Yglesias: The real problem with Nate Silver’s model is the hazy metaphysics of probability. In 1936, the Literary Digest ran a huge and very expensive poll to forecast the Presidential election. They collected about 2.4 million responses in a totally biased sample and predicted that FDR would lose. At the same time, George Gallup accurately forecasted the election with a sample size of only 50,000.
drive carefully: you are 18% more likely to die in a fatal car crash on Presidential election days (Good news: today is not a Presidential election, so you should be OK). what data do election forecasting models use to make predictions? Hint: they don’t all use just polling data. A WSJ Washington Wire blog post describes the Presidential election exit polling supply chain in New York in the immediate aftermath of Hurricane Sandy. The Washington Wire blog post highlights the polling firm Edison Research, based in New Jersey. Edison provided the questionnaires used by pollsters who would collect information about the ballots cast. As you might recall, New Jersey and New York were extremely damaged from the hurricane. One of the logistical challenges was in printing and delivering the questionnaires used by pollsters around the country. The questionnaires need to be timely, so they are usually shipped one week before the election. Sandy was on track to strike 8 days before the election, so a rush order was placed with the printer. Two thirds of the questionnaires were mailed before Sandy struck and Edison’s election office lost power along with the rest of New Jersey. The rest of the questionnaires were stored for two days until they had to be shipped. Edison printed the mailing labels from their main office, and then UPS shipped the 400 packages to pollsters via Newark Airport. While Edison had redundancy in their system (e.g., the mailing labels could be printed in another facility and a redundant system alerted employees of the change), it only worked because not all of their offices lost power. While Edison relied on UPS to deliver the mail, it is worth noting that USPS mail service continued as normal except for one day during Hurricane Sandy (HT to @EllieAsksWhy). Edison relied on having employees implement Plan B. With the gas shortage, it was difficult for employees to get to work when they needed to save gas for other car trips. Organizing car pools was more difficult than normal, since employees could not rely on communicating by email or cell phone. As I mentioned in an earlier post, there were few/no vacancies at hotels that had power, which provided challenges for Edison employees who wanted to work out of a hotel (most offices and homes were without power) or pollsters who needed to travel to different cities to perform exit polling. I’m not sure how these issues were resolved. The NYC public transportation was up and running on election day, so the pollsters could make it there for the big day. The subway reopened with limited runs the Thursday before Election Day and was running as usual on Election Day. What if Hurricane Sandy came later? Edison Research managed, but having an 8 day head start was helpful for successfully completing a contingency plan. If the hurricane hit 5 days or closer, the questionnaires would have already been printed and mailed. However, there may have been more challenges with getting pollsters to the polling locations in New York City and other locations (the subway may still have been closed on Election Day).